from the initial design right through to project implementation and completion. GeoSolv’s design approach is the same for all of our projects: Work closely with the client/project team from the initial assessment phase right through to the construction phase, all the while consistently meeting the unique project requirements. GeoSolv’s focus is on providing clients with quality and value at every stage of the design/build process. Our clear and structured production plans provide a stable, streamlined, and worry-free experience for all our valued clients. As a full-service, turnkey ground improvement and Innovative Foundation Solutions™ company, we handle every aspect of your challenging soil project from the initial design right through to project initiation and completion. GeoSolv works closely with general contractors, engineering consultants, developers and owners to ensure that their expectations are not only met, but also exceeded. Whether your project is large-scale or small, we work hand-in-hand with your team to ensure that every detail is as it should be, and to ensure the very best possible outcome. none of which includes costly, messy earth moving or over-excavation methods. Our team of trusted soil advisors and engineers continually works to ensure that projects are always competitively priced, and that critical timelines are always met. We honour and value the importance of trust in working relationships with all of our clients. Here are several ways our clients can incorporate us as into their projects as their trusted soil advisors. Initial draft boreholes are completed by the geotechnical consultant. 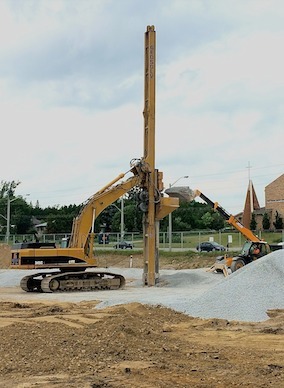 A GeoSolv Geotechnical Engineer will conduct a thorough analysis of the information, and will offer options on the preferred choices for structurally solving the soil issues. Our analysis is through: it takes into consideration the specific soil conditions as well as the planned structural demands on the soil. GeoSolv provides additional value by completing a complimentary feasibility study for your project. GeoSolv’s report will include a variety of possible soil solutions for the client to review. In some cases, for due diligence on land purchase, we can offer a very quick response time as needed with some preliminary comments on problem soil sites to help with a buy/no buy decision or to assist with information for the purpose of negotiation. requisite preliminary information on the project, and can turn around a detailed proposal to the geotechnical engineer, the structural engineer or owner to assist them in determining if there is an Innovative Foundation Solution that can provide value to the project. The more information you can provide, the more detailed we can be in our recommendations−from a preliminary feasibility study to a formal proposal. In this case, the project team would meet with a GeoSolv Geotechnical Engineer to discuss the particular soil challenges. With complete confidentiality, GeoSolv would then provide a thorough complimentary consultation to see if an Innovative Foundation Solutions could be applied to the project, helping to save time and money, or to reduce project risk. A follow-up proposal from GeoSolv would provide detailed information to the project team to help them make an educated decision as to which foundation system would work best for their particular project. time-saving value engineering alternatives at or after bid close. For example, ground improvement can often significantly reduce the risk of overruns as compared to overexavation and replacement. 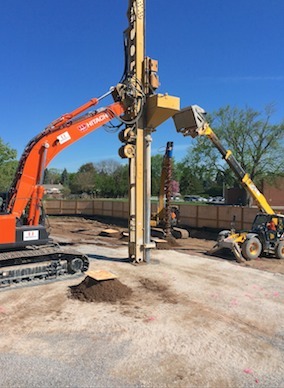 In situations where a building is on long piles, at times the cost of structural redesign can be more than offset by the savings on the foundation by using ground improvement to go from pile caps, grade beams and structural slabs to a simple slab on grade structure on ground improvement. Upon approval of GeoSolv’s proposal, we will work to design an innovative and cost-effective turnkey solution. Once all the project plans are in place, GeoSolv Design/Build will take on all design responsibility for the soil improvement work to be completed.